WiseMotion is a workshop concept which improves embodied cognition, self-awareness and collective understanding through dance and neuroscience. It is a series of masterclasses based on guided improvisation, neuroscientific explanation of the experience, and group conversation. On a WiseMotion masterclass, experience and knowledge come together and deepen understanding by utilizing the wisdom of both subjective experience and objective knowledge. Dance is a powerful way to connect with ourselves and others beyond the spoken language. 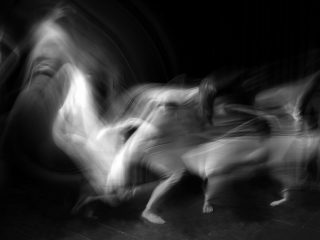 Dance improvisation is intuitive and spontaneous permitting full presence in the moment. When dancing, we might reach the inspiring flow state, or process our emotions, past and future in a natural way. Unfortunately, listening to ourselves and interacting intuitively are often forgotten in our demanding everyday life. However, they are great sources of joy, relaxation and maintenance of physical and emotional vitality. Cognitive and affective neurosciences help us to understand the brain processes related to thoughts, feelings and situations present in everyday life. By understanding these brain processes, we understand better ourselves and each other in different kinds of life periods. In a wider context, neuroscientific knowledge can be used to enhance creativity, imagination, emotional wellbeing and resilience. Talking together about shared experiences widens our perspective and our ability to understand one another. To listen, talk and to be heard in a respectful way are our fundamental needs. In addition, talking in a group enhances learning, and therefore, me can go home with new epiphanies! What language will the workshop be given in? My English is not so good, can I still join the workshop? In addition to English, we speak good Spanish and Finnish. We also speak some German and Swedish, so don’t let the language to prevent you from joining us! I like the idea but I cannot learn any dance steps, I just keep getting confused. Do I dare to join the workshop? During the guided improvisation, we don’t learn dance steps. We rather focus on our internal cues which direct us to move alone and in a group. We cherish the personal way to move and create a safe environment for everyone to enjoy and feel good when dancing. I’m eager to join the workshop and would like to come with my dad who has never danced. How can I convince him to come with me? WiseMotion is a great way to connect with dance for the first time. Everyone dances on their own level enjoying the skills they have. Non-dancers often show a spectacular imagination and creativity when bringing other aspects of life into the movement. I feel shy to move and talk in a group. Can I just come to watch and listen? On the masterclass, nobody is pushed to move nor talk. You can come to observe by giving yourself an opportunity and permission to participate. Maybe all the suddenly you find some inspiration behind the shyness which makes you want to move or talk. It is a liberating experience! I don’t understand contemporary dance. Will I understand anything on the workshop? WiseMotion is to be experienced rather than understood. By leaving out the judgement and self-control, we can immerse into the pleasurable experience of dancing. More we allow the sincere dance experience to emerge, more we have material to talk during the neuroscientific explanation and group conversation. I love to dance but neuroscience sounds so complicated. Do I need to have some basic knowledge of neuroscience to be able to join the workshop? It is our challenge in WiseMotion to explain neuroscience in a way that it is easy to understand also without background in neuroscience. We pick the most interesting parts of the recent discoveries in neuroscience and explain them to you in an inspiring way. I’m a neuroscientist and somehow curious about the concept. Is the neuroscience part on a very elementary level? Neuroscience has so many levels and sub-branches that I’m sure your and our knowledge will complement each other. We would be delighted to have your neuroscientific input during the group conversation! What’s the difference between Wisemotion Experts and Wisemotion Explorers? WiseMotion Experts is designed for professional dancers, dance students and other experienced movers such as martial artists, yogis and circus artists. WiseMotion Explorers is made for all curious movers regardless their background in dance. I’m a professional dancer but there’s only Wisemotion Explorers workshop in my city. I’d like to join to learn neuroscience but will I get bored with the dance part? During the dance experience, everyone moves on their own level. Therefore, you are free to challenge yourself technically during the improvisation. Internal listening is an important part of the WiseMotion dance experience. Tuning to your mental stage and setting the awareness to your bodily messages form a valuable training of maintenance for the professional dancers. Six months ago, I went through a knee surgery. Can I join the workshop? Please consult your physician before joining the workshop. We in WiseMotion welcome you wholeheartedly! Just mention us about your surgery before the masterclass. When dancing, you can take your improvisation to the direction which is tender to your knee. During the dance, you have a unique opportunity to observe how the new knee functions in movement. I suffer from an autoimmune disease and gut issues. Sometimes I’m really tired and my muscles get sore after training. Is WiseMotion too exhausting for me? Please consult your medical doctor before joining the workshop. We have experience of autoimmune disease and treating it successfully with holistic Autoimmune Protocol. In the Protocol, mediation and mild exercise are fundamental elements in addition to a diet and rest. We encourage you to join us and treat yourself with a light inspiring dance exercise and profound breathing. They make you relaxed, and better rooted and connected to yourself which have a positive influence on your overall health. I am obese and suffer from diabetes type 2. Is it risky for me to join the workshop? Please consult your medical doctor before joining the workshop. On our behalf, you are the most welcome to join! Just mention us about your health condition before the masterclass. We will take care that the joy of dance won’t carry you away too much which could make your body tired. I’m 67-years old and recently retired. Now I have time to try new things and WiseMotion sounds interesting. Am I too old to participate? There are no age limits for WiseMotion. We genuinely appreciate the participation of everyone. We feel honoured if you come and share your dance and your life experience with us! I’m conscious of my own space. Do I need to touch other people, and will they touch me? On the WiseMotion masterclass, there is some bodily contact with other people. However, this contact is created in a gentle and caring manner respecting the boundaries of everyone. Maybe after such a tender touch and dancing with a group, you notice how the experience made you feel good and relaxed. We also offer women only classes. There is no Wisemotion workshop in my hometown. Is it possible to have one here? Please contact us in WiseMotion and we will do our very best to bring the workshop to your hometown. We are also always open for new collaborations!